An NGO wants cost of Governance Reduced. 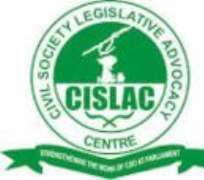 A non Governmental Organization Civil Society Legislative Advocacy Centre(CISLAC) on Monday called on Federal Government to reduce the cost of running the Government to help to create Job and reduce the rate of unemployment in the country. Executive Director(CISLAC) Auwal Ibrahim Musa made this known on Monday in Abuja while speaking at a Public Dialogue Session on Cutting the cost of Governance,Public Service Reform and Job Creation in Nigeria. He said that it is commonsense that no nation can develop without substantial and consistent investment in critical sector of the economy that promote the number of opportunity for her citizen to creativity engage in productive,income generation and wealth creating activities. "Reducing the cost of running the Government will help to create Jobs and the rate of unemployment". Auwal, said that this is possible only if it makes adequate provision for constructive capital expenditure in her budget and implements same to the latter over a long term. "The need to cut down the cost of governance for the nation to develop is no longer in dispute". "Indeed the debate has been more of how to go about it that whether or not to proceed in that direction". He also noted that this must be complemented by effective planning, and prudent and judicious management of public expenditure. Director,Geoscience Consulting,Mr Babatunde Adegbesan said that the issue of job creation is important in any country. According to him, Nigeria need to go back in the goal of development planning budget or the arms of government, Federal and State to leave to cut the cost of Governance.